This may be my favorite one yet. 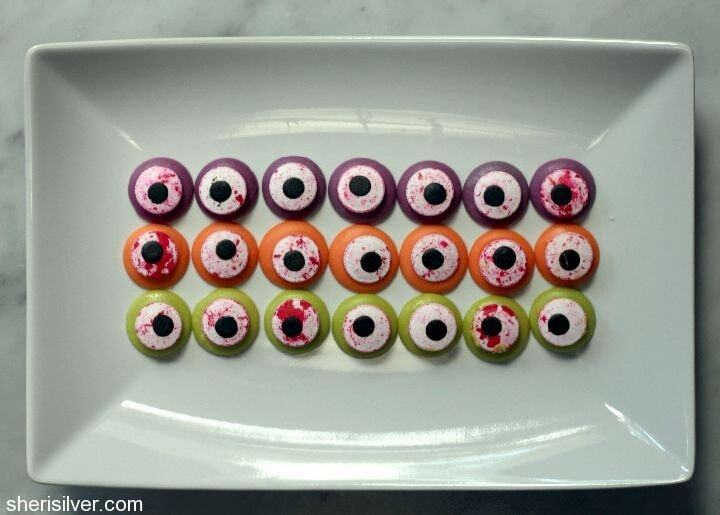 I mean, seriously – could you picture a bowl of these at a Halloween party? 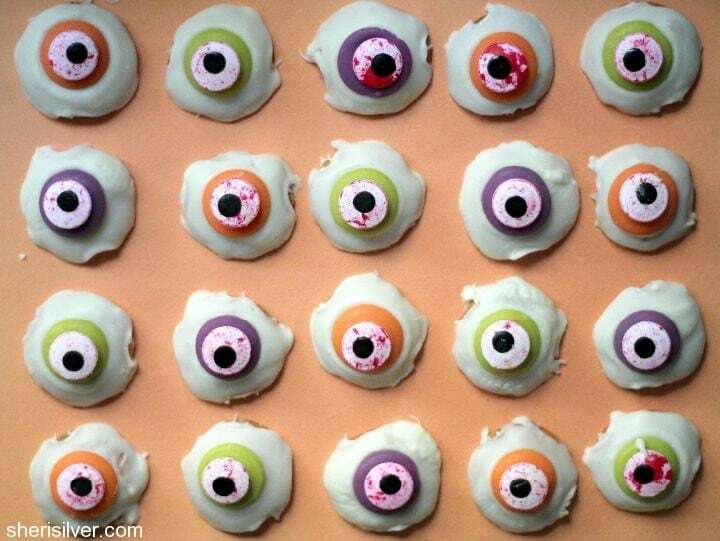 Or a few in a glassine bag as a trick-or-treat offering? Here’s another recipe that is no-bake, so it’s an easy one to pull together and a perfect project for the kids to help with! I hope you’ve enjoyed this series – which was your favorite? Line two baking sheets with parchment paper – arrange the Nilla wafers on one of the sheets and set aside. Arrange your colored discs on the second sheet and place in the oven. After one minute place your black sprinkle in the center of each disc and gently tap down to adhere. After about another minute (watch carefully) the discs will get shiny and begin to melt. Immediately remove sheet from oven. If needed, gently press the sprinkles into the discs. Place sheet in fridge or freezer for a few minutes so that the discs can be easily removed. Melt the white discs in the microwave or in the top half of a double boiler filled with simmering water. Coat the wafers: using a fork to hold the wafer over the chocolate, use a spoon to cover completely, allowing the excess to drip back into the bowl. Place the coated wafer back on the lined sheet and immediately press a colored disc in the center. Do these one at a time so that the white discs don’t have a chance to set. When all of the cookies have been completed, place sheet in the fridge or freezer for a few minutes to set. 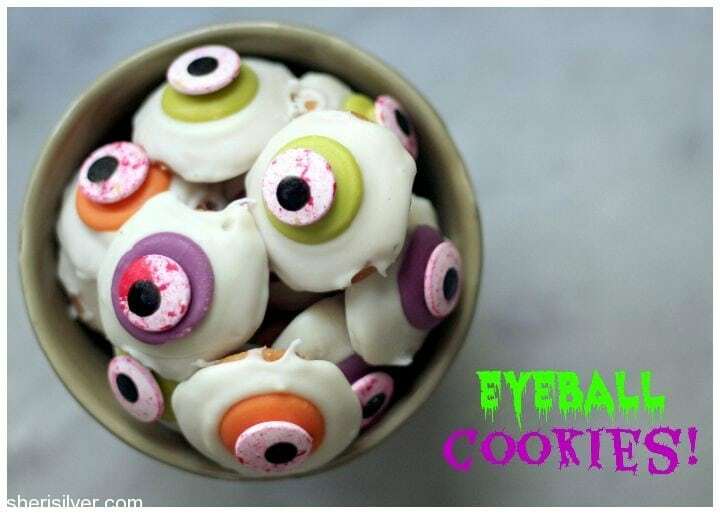 Be sure to check out my Halloween Pinterest board too! Love these!! So very cute! And so easy for someone like me who’s not a baker. Thanks Marti – super easy!